McCarthy stands in front of the Blanco 4-meter telescope inside of the dome of the Cerro Tololo Inter-American Observatory. From galaxies that span over 100,000 light years in diameter, to cell wall microfibrils with an average diameter of 10 nanometers, new discoveries continue to reveal astonishing complexity in our universe. 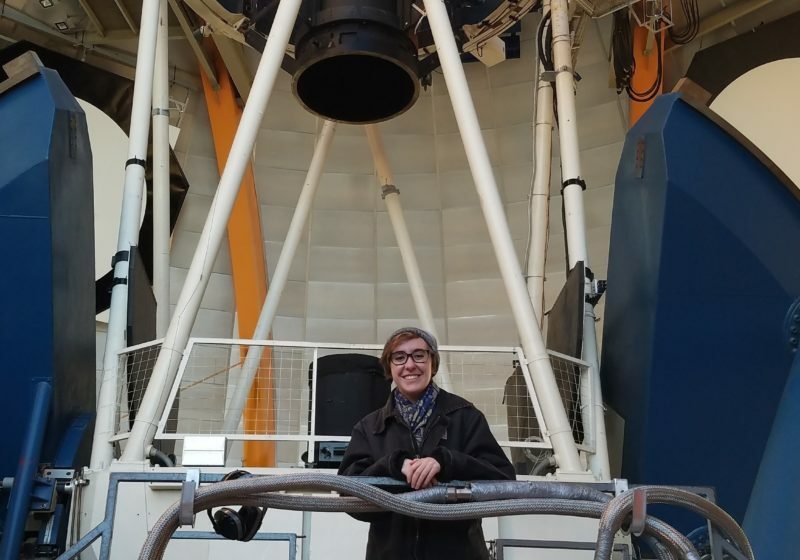 This week, I spoke to UR senior Elise McCarthy, who went to Chile to characterize distant extrasolar objects: research that helps us understand our place in the universe. What’s the difference between a low-mass galaxy and a high-mass globular cluster? The punchline is more convoluted than you’d think. Astrophysicist Elise McCarthy spent her summer at the Cerro Tololo Inter-American Observatory in La Serena, Chile, characterizing Reticulum III, a dwarf galaxy so small, it might not be a galaxy at all. Actually, size doesn’t distinguish galaxies from globular clusters. “All galaxies, no matter how small, are embedded in a halo of dark matter,” McCarthy said. Globular clusters form within other galaxies, and thus lack this halo. Scientists characterize galaxies “indirectly and with great caution,” in part by detecting electromagnetic waves, including visible light, that radiate from stars. Bright stars can help determine the distance between galaxies. McCarthy has been interested in galactic dynamics and evolution since her sophomore year, and began her research career in the physics department at UR with Dr. Alice Quillen. McCarthy forged the connection with a simple email. “Don’t be afraid to email someone you don’t know, about research you don’t understand yet,” McCarthy said. “Doing research benefits people — it’s fun, it’s interesting, it’s good experience, it’s challenging, you need to solve a variety of problems and you need to decide what’s important or interesting because often there is no straight answer,” Quillen said. The open-ended nature of research piqued McCarthy’s interest and let her apply the skills she had acquired from her coursework. “It’s a problem that nobody has solved before and that’s really interesting,” she said. A world, or more appropriately a universe, of opportunities opened up to McCarthy soon after she got involved in galactic research. She has been able to use the most powerful instruments and technology on our planet to observe distant galaxies. McCarthy is now interested in another indicator of galaxy status among extrasolar objects: periodic variable stars. These stars are generally more abundant in galaxies, and can help distinguish galaxies from globular clusters. They pulsate in size and brightness over the course of 24 hours, and scientists use them as “standard candles” to determine the relative distance of other objects in our universe. This function makes variable stars extremely valuable to astronomers. Using data collected by SOAR, the Southern Astrophysical Research Telescope, McCarthy aimed to identify a variable star, or standard candle, in the Reticulum III galaxy to determine its distance from the Milky Way. Curiously, she didn’t find any such stars. The absence of variable stars suggests that Reticulum III is a high-mass globular cluster, not a galaxy. This hypothesis would need to be tested by detection of dark matter. The results of the investigation will improve the understanding of how our own galaxy interacts with other extrasolar objects, and how they interact with each other. This in turn helps scientists build a history of how our galaxy formed and helps them predict future galactic dynamics and evolution. Doing research highlights the relevance of knowledge, as well as its dynamic nature. We’re constantly learning new information that might refute previously accepted “facts,” especially in an elusive field like astronomy. “We know nothing and honestly that’s pretty great,” McCarthy said. McCarthy is applying to four Ph.D. programs abroad, including the Leiden Observatory in the Netherlands, which collaborates with the Leiden Institute of Physics, the Mathematical Institute and the Leiden Institute of Advanced Computer Science. The field is multidisciplinary by necessity. “Data science is the future of astronomy,” McCarthy said. McCarthy’s findings will be published along with data from four other globular clusters, two of which contained variable stars. She will present her work at the American Astronomical Society conference this January. Remnants from the formation of the Milky Way, these dwarf galaxies inform our understanding of how our own galaxy collides and merges with others in our local universe. 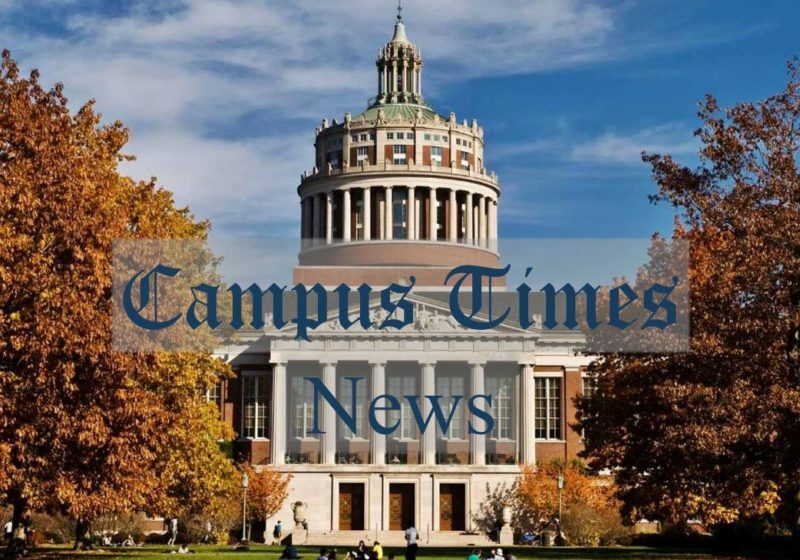 Editor’s Note: Research Rochester is a new column about cutting-edge research done by UR students both here and abroad.